The Binary Ninja Intermediate Language (BNIL) is a semantic representation of the assembly language instructions for a native architecture in Binary Ninja. BNIL is actually a family of intermediate languages that work together to provide functionality at different abstraction layers. This developer guide is intended to cover some of the mechanics of the LLIL to distinguish it from the other ILs in the BNIL family. The Lifted IL is very similar to the LLIL and is primarily of interest for Architecture plugin authors. If you're writing an analysis plugin, you'll always want to be working at LLIL or higher. During each stage of the lifting process a number of transformations take place, and each layer of IL can have different instructions. Because of this, you can not rely on an instruction from one layer existing in another. Since doing is the easiest way to learn let's start with a simple example binary and step through analyzing it using the python console. This will print out all the LLIL instructions in the current function. How does this code work? First we use the global magic variable current_function which gives us the python object function.Function for whatever function is currently selected in the UI. The variable is only usable from the python console, and shouldn't be used for headless plugins. In a script you can either use the function that was passed in if you registered your plugin to handle functions, or you can compute the function based on a specific address, or maybe even just iterate over all the functions in a BinaryView (for func in bv.functions:). Next we get the lowlevelil.LowLevelILFunction from the Function class: current_function.low_level_il. Iterating over the LowLevelILFunction class provides access to the lowlevelil.LowLevelILBasicBlock classes for this function. Inside the loop we can now iterate over the LowLevelILBasicBlock class which provides access to the individual lowlevelil.LowLevelILInstruction classes. Finally, we can print out the attributes of the instruction. We first print out address which is the address of the corresponding assembly language instruction. Next, we print the instr_index, this you can think of as the address of the IL instruction. 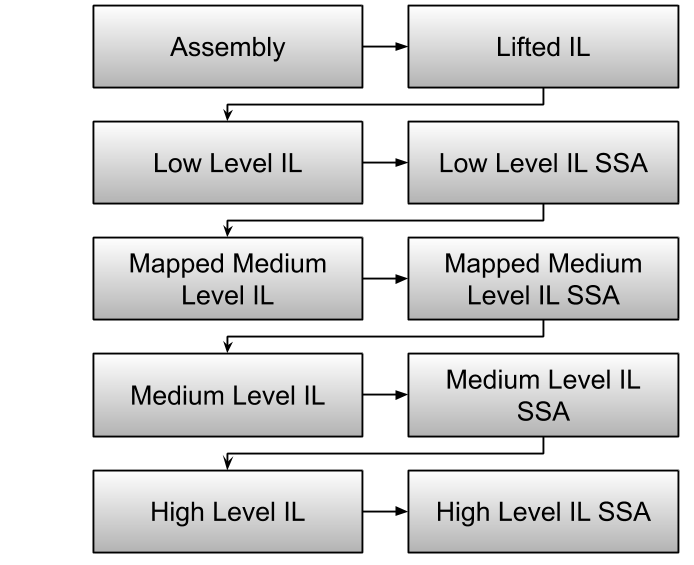 Since translating assembly language is a many-to-many relationship, we may see multiple IL instructions needed to represent a single assembly language instruction, and thus each IL instruction needs to have its own index separate from its address. Finally, we print out the instruction text. There are quite a few reasons that we chose to use expression trees that we won't go into in detail here, but suffice it to say lifting to this form and reading this form are both much easier than other forms. operands - returns a list of all operands. Going into gross detail on all the instructions is out of scope of this article, but we'll go over the different instructions types and speak generally about how they are used. When parsing an instruction tree the terminals are registers, constants and flags. This provide the basis from which all instructions are built. LLIL_SET_REG - Sets a register to the results of the IL operation in src attribute. LLIL_SET_REG_SPLIT - Uses a pair of registers as one double sized register, setting both registers at once. LLIL_SET_FLAG - Sets the specified flag to the IL operation in src attribute. Reading and writing memory is accomplished through the following instructions. LLIL_LOAD - Load a value from memory. LLIL_STORE - Store a value to memory. LLIL_PUSH - Store value to stack; adjusting stack pointer by sizeof(value) after the store. LLIL_POP - Load value from stack; adjusting stack pointer by sizeof(value) after the store. Control flow transfering- and comparison instructions are straightforward enough, but one instruction that deserves more attention is the if instruction. To understand the if instruction we need to first understand the concept of labels. As you can see from the above code, labels are really just used internaly and aren't explicitly marked. In addition to if and goto, the jump_to IL instruction is the only other instruction that operates on labels. The rest of the IL control flow instructions operate on addresses rather than labels, much like actual assembly language instructions. Note that an architecture plugin author should not be emitting jump_to IL instructions as those are generated by the analysis automatically. LLIL_JUMP - Branch execution to the result of the IL operation. LLIL_JUMP_TO - Jump table construct, contains an expression and list of possible targets. LLIL_CALL - Branch execution to the result of the IL operation. LLIL_RET - Return execution to the caller. LLIL_NORET - Instruction emitted automatically after syscall or call instruction which cause the program to terminate. LLIL_IF - If provides conditional execution. If condition is true execution branches to the true label and false label otherwise. LLIL_GOTO - Goto is used to branch to an IL label, this is different than jump since jump can only jump to addresses. LLIL_FLAG_COND - Returns the flag condition expression for the specified flag condition. LLIL implements the most common arithmetic as well as a host of more complicated instruction which make translating from assembly much easier. Most arithmetic and logical instruction contain left and right attributes which can themselves be other IL instructions. The double precision instruction multiply, divide, modulus instructions are particularly helpful for instruction sets like x86 whose output/input can be double the size of the input/output. The rest of the instructions are pretty much self-explanatory to anyone with familiarity with assembly languages.